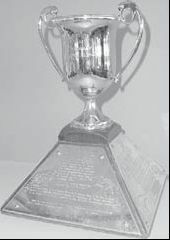 Awarded at Maadi (National Champs) since 1947 to the winner of the Boys under-18 eight, the Cup is currently held by Hamilton Boys High School [HAMB]. The Hamilton Boys High School crew won the event in 2013 by less than a canvas from Napier Boys High School [race results]. This cup, the gift of Dr Youssef Bahgat of the Cairo Rowing Club, Egypt, was presented to the Maadi Camp Rowing Club as a token of friendship between members of the Cairo Rowing Club and "Kiwi" oarsmen of the Second NZEF following the winning of the Fryberg Cup by the New Zealand oarsmen in competition with members of the Cairo Rowing Club at a regatta on the Nile on the 20th November, 1943. The Kiwi oarsmen of Maadi Camp Rowing Club won the regatta for the Freyberg Cup by 11 points to 6. However, they donated the trophy to the Cairo Rowing Club for future competition. In return Dr Bahgat presented the Kiwi oarsmen with the cup that was to become the Maadi Cup. At the conclusion of the war it was brought back to New Zealand where it named the Maadi Cup and presented to the NZARA (now the NZRA) for the annual eight-oared competition among the New Zealand Secondary Schools. The first race was held at Wanganui in 1947 and it was won by Mt. Albert Grammar.